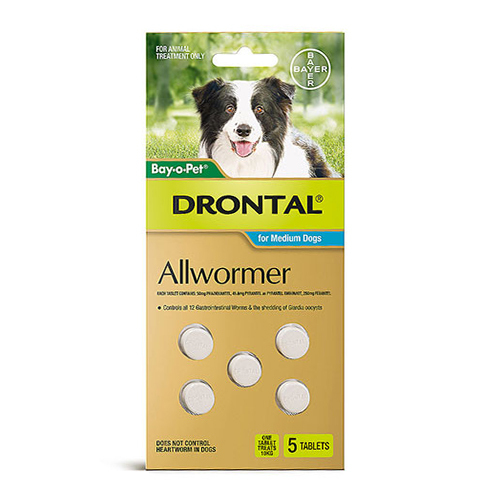 For protecting dogs from different intestinal worms, Drontal Allwormer for dogs is an ultimate product. This broad-spectrum chewable anthelmintic tablets destroys various intestinal worms including roundworms, whipworm, hookworms and tapeworms. This simple to dose treatment is easy to administer in dogs. This monthly treatment protects canines from harmful diseases and prevents re-infestation. 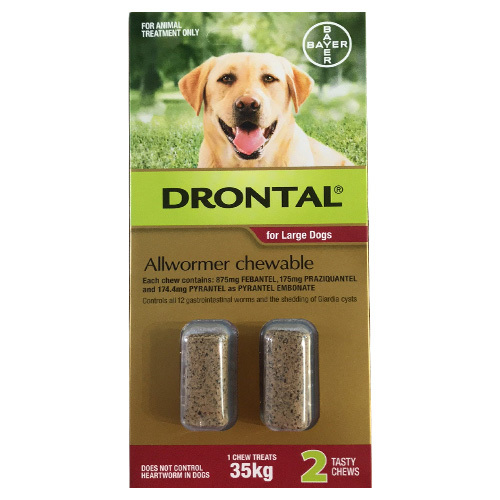 Drontal Allwormer contains three key ingredients having varied modes of action and spectra of activity. Praziquantel is active on tapeworms. Following exposure to Praziquantel, the tapeworm loses resistance to get digested by the host. Because of this, partially digested tapeworms are seen in the stool, whereas majority of them are digested and are not found in the feces. The other ingredient Pyrantel Embonate is active against hookworms and ascarids. Pyrantel Embonate acts on the neurotransmitter acetylcholine of the nematode resulting in spastic paralysis. The natural mechanism of the intestinal tract then eliminates the parasite. Febantel is active against nematode parasites including whipworms. Febantel rapidly gets absorbed and metabolized in the host animal. When exposed to this ingredient, the parasite’s energy metabolism is blocked, leading to energy exchange breakdown and inhibited glucose uptake. Thus, Drontal acts on multiple intestinal worms and removes them. Give Drontal in a single dose. Treatment with Drontal does not require fasting. Drontal is given as a single dose. Administer directly into the mouth or mix it with food and give. Treat at 2, 4, 8, 12 weeks, then 4, 5, 6 months of age. Treat at every 3 months. Treat at every 6 weeks in hydatid infested locations. Treat prior to mating, 10 days before whelping and 2 and 4 weeks after whelping. Before starting treatment consult your vet. Give dosage according to your vet’s directions. 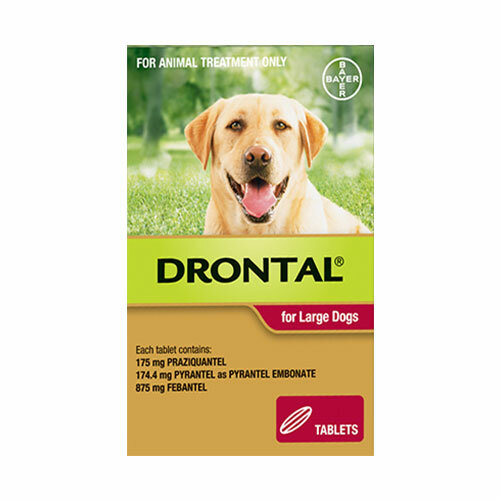 Drontal is available in three different packs according to dog weight. 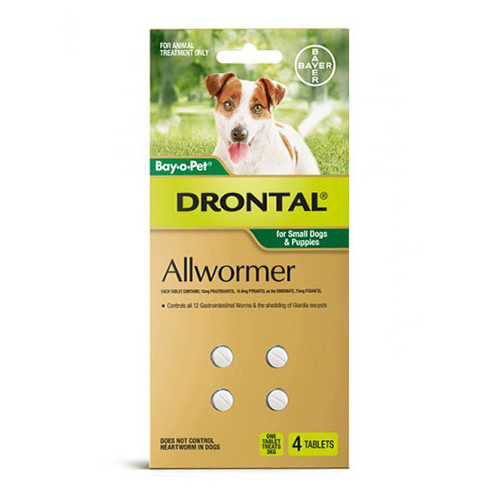 Drontal Allwormer is a potent treatment for multiple intestinal worms. It kills and controls various gastrointestinal worms such as hookworms, tapeworms, whipworms and roundworms. The flavored tablet is easy to administer in dogs. The single dose treatment protects dogs against tapeworm infection for 3 months. Wash hands after treating with Drontal. Humans can contract tapeworms from animals, so it is necessary to follow strict hygienic rules. Clean up dog stools daily to avoid re-infestation. 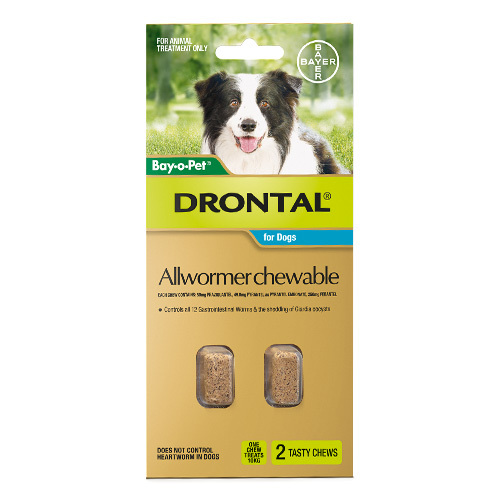 Do not treat dogs allergic to any ingredient of Drontal Allwormer. Avoid treating a dog if it is already treating with an alternative dewormer unless advised by your vet. It is one of the best worming products I have used on my dog. Works amazingly and doesn't have any side effects as well. One of my friends had recommended this product for my dog. After using it, I must say he was absolutely correct. Drontal is definitely a potent dewormer. Ever since I have brought my two new pups I have been deworming them with Drontal and they are growing quite healthy. 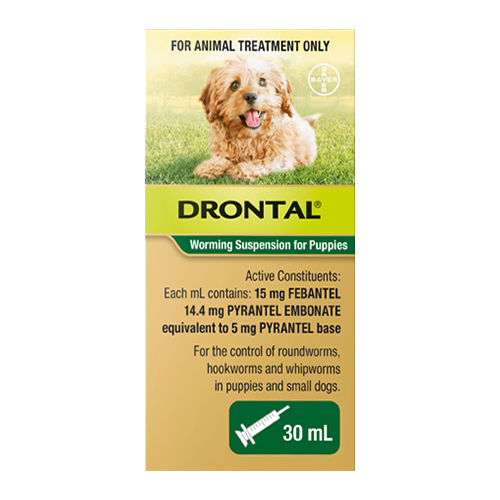 I did try another product a couple of months back but for my pups Drontal works most perfectly. This is ultimate product and treatment for the destroying the warms my dog have. Toby is 5 weeks old, and I shocked it got tapeworm infection, I start providing this tablet asap and now, it is feeling good.